Egypt and Sodom, Where the Lord was Crucified | Theopolis Institute | Bible. Liturgy. Culture. The Revelation can only be understood in the light of Old Testament symbols and sequences. The same is true of the epistle of Jude, which serves as a blistering hors d’oeuvre to John’s fiery feast. Possibly written by the apostle Judas Thaddaeus (Luke 6:16; Acts 1:13; John 14:22), the epistle is an encyclical exhortation rather than a letter to a particular local congregation. This indicates that the author held some authority in the Firstfruits Church. Claims of late authorship (70-90AD) result from a failure to understand the covenant context of the epistle, and indeed of the entire New Testament. The end of Judaism and its royal purpose was at hand, and the lies of Judaizers without and within continued to confuse the saints. There was a pressing need to remind believers of the dangers of apostasy. For that purpose, Jude’s tirade is a shooting gallery, and he most definitely has all his ducks in a row. As with the other epistles in the final section of the canon (especially Hebrews), Jude was written mainly with Jewish Christians in mind. Without that understanding, the epistle becomes detached from history and its author wrongly perceived as a “chicken little.” But the letter uses an Old Testament sequence that is a common literary device employed by the biblical authors—the first seven books of the Bible as an antitypical “Creation Week.” This indicates that it was written prior to the destruction of Jerusalem. The structure is not only the key to comprehending Jude’s reason for writing but also explains his apparently eclectic allusions to Old Testament history. Once the covenant-literary shape is perceived, it becomes clear that there is nothing random or indiscriminate about the text in any way. It is a carefully-considered and beautifully constructed overture to the dramatic finale of the apostolic witness. Jude begins with a subtle allusion to the book of Genesis, which seems to be an arbitrary observation until it is recognized as part of a sequence. He is taking his audience on a trek through the wilderness—a familiar theme in the epistles of Paul and Hebrews—in order to sort the sons of men from the Sons of God, those who were still bond-servants to the kingdom of the Egyptian-hearted Herods from those who were about to inherit a heavenly country by faith. The heptamerous structure of the epistle of Jude alludes to a number of corresponding biblical sequences (what I refer to as the Bible Matrix, reiterations of Genesis 1). These include the biblical covenant pattern, the Heptateuch (Genesis to Judges), Israel’s annual festal calendar (as presented in Leviticus 23), and the sevenfold pattern of sacrifice (choosing and cutting the animal, presenting the flesh, purification by fire, fragrant smoke, savoring by the Lord, and reconciliation). Only with this multi-channel typological process of transformation in mind can we understand both Jude’s logic andhis terrifying jokes. The epistle of Jude is a masterfully-cut literary crystal. Beholding it as such allows it to catch the light of previous sacred texts and reveals the author’s full intentions with a terrible clarity. Jude not only uses literary allusion but also literary structure to bring comfort to the saints and terror to the apostates. The Jews who denied Christ considered themselves to be safe in the arms of Moses, but Jude reminds his hearers that it was those who were following Christ who were the successors of Israel and the true heirs of the Old Covenant promises. The second cycle (“Passover/Exodus”) is fivefold, alluding to the Pentateuch, the covenant pattern, and its twofold expression in the Decalogue. However, the final step (Succession)is missing. Those who were given authority by God but had misused it would have that authority—and indeed their entire inheritance—taken away. Their kingdom would be given to those who would bring forth the fruit that God desired (Matthew 21:43). Jude re-establishes his own authority and also that of the Scriptures, which must be kept fresh in our minds if we are to discern and meet contemporary challenges. that Jesus, who saved a people out of the land of Egypt, afterward destroyed those who did not believe. 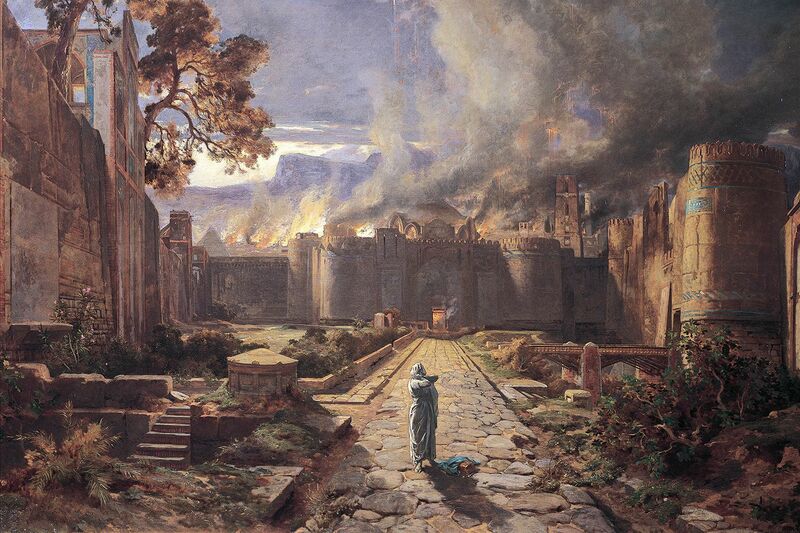 Egypt and Sodom were two cities from which God rescued His people. Figuratively, they are the negative counterparts of two faithful women, Hagar and Sarah (Galatians 4:21-31). Egypt relied upon the waters below (the River Nile) and Canaan relied upon the waters above (rain from heaven). This explains the placement of the two cities at Hierarchyand Oath/Sanctions— matching each other chiastically—in this cycle. Revelation 11:8 uses the names of these two cities to mock first century Jerusalem, the contemporary “city of destruction,” one that was not only intent on shedding the blood of the sons of Israel but also due to receive the sorrows that come to those who desire to be rich (Ezekiel 16:49; 1 Timothy 6:9-11). James Jordan identifies these “angels/messengers” as the preachers in the lineage of Seth before the Great Flood, whose ministry of sacrificial mediation was compromised and eventually failed due to the corrupting influence of intermarriages with Cainite women.1 However, both Peter and Jude use the word “angel” elsewhere to identify actual angels (2 Peter 2:11; Jude 9). The transgression of these spirit ministers from God’s heavenly court does resemble the sin of the fleshly ministers of His earthly Sanctuary, although it was not sexual in nature. These beings abandoned their appointed roles as servants, “keepers” in God’s court. The literary logic of this entire cycle (verses 5-7) is made apparent in Jude’s use of two vertical columns in this stanza, each of which follows the fivefold covenant sequence. The first describes the past and the second describes the future. The structure is a reference to the two trees at the center of the Garden in Genesis 2,2and to the two bronze pillars of Solomon’s Temple. Both of these sacred “doors” picture Priesthood(submission to heaven: the Tree of Life) and Kingdom(dominion on earth: the Tree of Wisdom) as the gateway to Prophecy. The third “pillar” is the mobile, indwelling Shekinah. Together, these three are represented by the three items of furniture in the Holy Place. However, here there is light where there ought to be darkness, and darkness where there ought to be light. Having abandoned their station as servants of God, these rebel angels were denied even the power that they previously enjoyed (Luke 19:26). Revelation 8:10 tells us that after the ascension of Christ (as our legal Advocate), Satan (our legal Accuser) was thrown down from heaven, and took up residence in Herod’s Temple, the “Edenic” Garden-Sanctuary of the day. Instead of eyes being opened as they were in Eden, the eyes of the Jewish rebels were darkened. The reign of Israel’s Davidic kings was bookended historically by two men who lost their eyes before the pillars came down, Samson (Judges 16) and King Zedekiah (2 Kings 25). Just so, the Judaizers were the blind leading the blind, and their rejection of the priesthood of Jesus would see their “Edenic columns” razed to the ground. In God’s economy, immediate judgment is not the norm. That can be observed in the atonements made for Adam and Cain, and God’s patience with the kings of Israel. Where judgment does occur immediately—such as with Israel in the wilderness, or the deaths of Ananias and Sapphira—it is intended as a warning sign. The death of Herod Agrippa in Acts 12 was also such a sign of the impending judgment of Jerusalem. The cities of the plain enjoyed an Edenic abundance, one that Lot desired but Abraham eschewed. God had promised Abraham a fruitful land and a fruitful womb but he would have to be patient on both counts. The application to the Judaizers is thus twofold: firstly, the destruction of Jerusalem would be a sign to the nations, an example of the vengeance of God against those who would persecute His people; and secondly, the Jewish rulers were guilty of setting up for themselves a utopia founded upon rebellion against God. Like Lot’s wife, they were impatient for kingdom and prosperity, and would thus be cut out of history. The saints to whom Jude was writing were being exhorted not to look back to the old cities in case they suffered the same judgment—the barrenness and sterility of a sulphuric land and a salted womb. The sins of the flesh, murder and adultery, are “kingly” sins, but they resulted from the corruption of the Priesthood—going after “strange” (different, other, neighbor’s) flesh. The cities of Judah were a stink in God’s nostrils just like the stink of the rivers of blood in Egypt (Exodus 7:21). Revelation describes the Judaizers as a false “bridal army,” phoney Nazirites who ascend from the pit as clouds of sulphur under a vow of “holy war” against the saints (Revelation 9:1-11). As idolaters, they were not only unable to discern the fragrance of the Gospel of Christ (Deuteronomy 4:28; 2 Corinthians 2:14-17), but also the rancor of their own self-righteousness before God (Leviticus 26:31; Isaiah 65:5; Amos 5:21). In contrast, the obedience of the saints was like the savor of the “ascensions” offered by Noah and Aaron (Genesis 8:21; Leviticus 1:17; Ephesians 5:2; Philippians 4:18). Jude was not the first prophet to use the cities of the plain to engage in “name calling” against his prophetic nemeses. Adapted from Michael Bull, The Shape of 1-3 John & Jude: A Covenant-Literary Analysis(forthcoming). Mike Bull is a graphic designer in the Blue Mountains west of Sydney in Australia, and author, most recently, of Schema: A Journal of Systematic Typology, Vol. 2. 1. ↑ James B. Jordan, “Who Were the Angels of Jude 6?”, Biblical HorizonsNo. 1. For a discussion of polygamy as a means of evading the curse upon the womb, see Michael Bull, Big Love: A History of Stolen Fruit. 2. ↑ See Michael Bull, Covenant Structure in Genesis 2. 3. ↑ For a more detailed commentary, see Michael Bull, Moses and the Revelation: Why the End of the World is not in Your Future, 153-169. 4. ↑ For more discussion, see Michael Bull, Altar of the Abyss.